The end of the property boom means that the property supplement in my Sunday newspaper is now a mere 8 pages as compared to the dizzying 40 pages of just a few short months ago. Since I set up my Twitter account and my Google news alerts I now know what will be on the 6 o’clock news often before the newsreaders themselves have their script. My RSS reader feeds me newly unearthed scandals before PrimeTime has a chance to send the researchers out. Are we coming to the end of journalism as we know it? Journalist, Jennifer O’Connell asks this question in a comment piece in one of today’s papers. Her concern is that she might not have a job in the next few years as the face of journalism seems destined to change forever and the fate of the mighty newspaper seems to be written on the wall for all to see. The Internet, and more particularly social media tools such as YouTube, Twitter, Flickr and blogging, all dilute the influence of traditional journalism as the news powerhouses. Jennifer points out that “newspapers are dying” since “readers – younger readers especially – don’t want to pay for yesterday’s or last week’s news any more, and advertisers won’t follow where readers have stopped going.” There is much truth here as today consumers are spending over three times as much time online than they do reading newspapers and for the first time online advertising spend in the UK has reached 19.8%, surpassing spend on advertising in both newspapers and magazines combined. I share Jennifer’s lament at the prospect of the disappearance of my Sunday newspaper. I enjoy the ritual of the Sunday morning trip to the newsagent where all the other blokes (invariably) in the neighbourhood are picking out their favourite reads. Then off home, and with a pastry and a decent mug of coffee begin a treasured half hour or so paging through the Sunday’s finest. However, even I’m finding that this routine is changing. Depending on how hectic the Sunday schedule is, I might find myself going online to catch the headlines before heading out for the day. I was disappointed recently to see that one of the Irish newspapers decided not to release their online edition until 6pm on a Sunday evening. This is a very clear push back against their customers who are transitioning from print to online. Ultimately this is futile as there are others, like Bernie, who will give us the Sunday papers online, even if the publishers won’t. 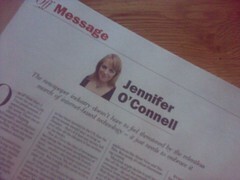 Jennifer O’Connell suggests an alternative approach for traditional print media. She highlights that newspapers can “still do some things better than the shiniest video iPod. Opinion and analysis, for one thing. Design for another. Photopgraphy. Crosswords. Special commemorative editions. Important world events. Local news. Niche news. Letters pages. Reliable, interesting, thought-provoking content. A respite from all that distracting technology”. Now, while I’d be happy to argue with Jennifer that for many of those things social media is far more useful, I’ll certainly not argue against the requirement for good journalism. Journalism will not die so long as journalists embrace the new technologies that their audiences are using. Most bloggers are offering opinion and analysis and are not trying to be journalists. We respect journalists and their role in society. However if they are not doing (as Jennifer puts it) “the things we haven’t been so good at doing: immediacy, innovation, interaction and…. the internet” they will simply be sidelined. I was delighted to see national broadcaster RTÉ this week bring prominent Irish bloggers Damien, Darragh, Suzy, Alan, John and Tommy in to meet staff in their news and current affairs departments. While this initiative certainly helped the bloggers understand a little more about how traditional news is compiled, I’m sure there was as much to be gained by the broadcaster in understanding this new breed of opinion shapers. Our media consumption behaviours are going in only one direction. Time will tell how complete the transition will be and how many journalists will be joining us on the journey. If Bernie’s (very useful) Sunday paper roundup makes people not buy papers then those papers do not deserve to be purchased if summarised so quickly and concisely. Says a lot about the content no? The papers should actually be paying people like Bernie to do these guides and have him direct not deflect people from the papers. Had they good content then less deflections. Jennifer is right but talking the talk is all well and good, walk the walk is what’s needed. The quality and analysis in papers has gone down, not up. Now you hire some fat git from Cork to spew hatred at whoever his editor wants attacked and that’s analysis and opinion. No wonder people are reading blogs by people who are passionate about their subject areas, not passionate about their wage slip. She’s totally wrong and ignorant about young people not wanting to pay for content though. They pay for iTunes downloads, so they do pay for content, not just the stale crap her boss produces. The net didn’t kill newspapers, nor Google and certainly not bloggers. They’re killing themselves. The only one that will survive right now appears to be the Guardian. Hi Damien. One of the reasons the Guardian is top of the pile right now is because they have the vision to do this. Excuse my ignorance, does Jennifer work for the Sunday Independent? I don’t read that one, I can get all the slanted opinion I need from irreputable online sources. Incidentally, it’s almost laughable that I couldn’t find the article when I went searching Google, Google News and Independent.ie for it. I’m presuming it’s the SIndo from reading Damien’s comment. Journalism isn’t dying, it’s flourishing. Just because the same number of people won’t be getting paid to write opinion and analysis columns doesn’t mean journalism will die, that’s sheer arrogance on the part of newspapers. Since when did opinion columns like that constitute journalism anyway? Just because it’s in print it doesn’t make it so. “Journalism” as we know it may fall off a cliff, we may not have the 3AM Girls in ten years time, bloggers will cover that type of stuff simply for the social status it would allow them and the freebies they’d get, but real journalism, campaigning journalism that has a serious impact on society, will not die out, anyone analysing the changes in the media knows that. There are too many people interested in knowing about that. Newspapers are generally inefficient, bloated institutions, the weakness in their business model has been hidden beneath a booming property market for ten years, now that the number of advertisers have jumped through the hole in the floor left by the economy and internet usage has gone through the roof newspapers have been left naked in the breeze. They’ve had ten years to cop onto the forthcoming changes and most did nothing, they should of noticed that social networking was their future not their demise. While they were wringing their hands about bloggers supposedly looking to take their jobs bloggers were taking advantage of most of the free tools that newspapers should of been first to use. Bloggers were innovating, newspapers were digging monstrous holes in the sand and happily burying their egos. Until newspapers start focusing on what their online presence will look like in five years time, instead of investing the amount of time in online that they should been doing five years ago, they’ll struggle. But so what, I can live without Metro, Herald AM, The Star. Society can live without them. Can we continue without a platform for Stephen Collins, Declan de Breadan, Ciaran Hancock or Mark Hennessey (or other balanced but non-Irish Times journalists who may be more towards your newspaper taste)I think not. Newspapers need to adapt to ensure we don’t, if they don’t someone will come along and open the website newspapers should have developed and “drink their milkshake”. It’s already happened in the States with HuffPo, TPM etc who got in ahead of the game. Luckily the newspapers doing the important work internationally are the ones investing online, Guardian, Telegraph, NY Times and in Ireland, to an extent and continuously developing, The Irish Times. Some of those may reduce the number of print days and go online daily with three-day print weeks, but they look set to survive the turmoil facing the media and grow in a much more stream-lined and efficient system thereafter. Your Sunday paper is (generally) safe. The daily papers are the ones in trouble. Hi Mark. Sorry, I should have actually stated in the post that the newspaper was the SB Post. Their webpage wasn’t live with this article at the time I was writing on Sunday! You make a good point about the dumbing down on the content in newspapers. How much of what is presented to us as journalism is mere reproduction of press releases and very often softer opinion and comment pieces? The dearth of hard-hitting investigative journalism is becoming increasingly obvious. If that is what journalism is about today then I cannot see why I (and more like me) would not spend more time tuning into my favourite opinionated bloggers.